Today, mobile communication technology have become irreplaceable on people’s life. meanwhile the construction of the base station and communications machine room are increasingly comprehensive. nevertheless, as the power shortage of our country, a large area power off of the base station&communication machine room have appear frequently due to the power cut by electricity supply department under the implementation of the electricity sector staggering policy. Battery is the core device for security the power supply for communication equipment, communications equipment requirements for power quality directly determines the choice of battery requirements. communications industry is currently the most used and most long lead-acid batteries, was also the most widely used application, which is divided into rich and poor hydraulic fluid two categories.Europe and other countries has been in use flooded batteries, the main feature is the need to add electrolyte maintenance, or use a more reliable and stable. around year 2000, China have began large-scale use of depleted liquid battery, its main products are valve regulated lead acid batteries, because of their low cost, easy maintenance,and use of technology over the years has been widely developed and improved, the use effect is stable reliable. 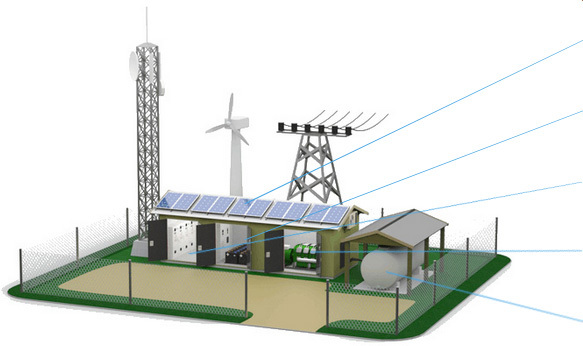 Communications operators currently been using lead-acid VRLA battery, good price advantage has been the primary operator fancy, at least for a longer period of time inherent in the status of communication power industry still can not shake, but it also has problems which can not be ignore. first, the environmental problems can not be solved, because the main materials accounted for the largest lead, an important step in the manufacturing and recycling process is inevitable melt lead, inevitably cause significant adverse environmental pollution.as China began to pay attention to environmental protection, operators have begun to gradually improve their environmental philosophy, for all aspects of batteries, including production,transportation, storage, use, scrap the whole process of how to reduce pollution and how to reduce energy consumption made more high demand, especially in the second half of 2015,China has adopted a series of lead-acid battery production chain for environmental regulations for environmental protection do not meet the requirements of suppliers around should be closed down for rectification, resulting in production of VRLA batteries suffer a very big impact, bring to the construction of communication considerable pressure. followed by the reliability and stability issues, VRLA battery life is greatly dependent on the ambient temperature, under high temperature conditions will accelerate the corrosion of the plate and dehydration, leading to decreased battery capacity, greatly reduce the short life expectancy. This requires a more practical, more reliable, more environmentally friendly lead-acid battery back-up batteries gradually be replaced. Lithium iron phosphate cathode material is a new type of lithium batteries, accumulators as a new environmentally friendly products, the current situation is mainly used in the electric vehicle industry, which until a few years before slowly came into contact with the communications industry. As the communications industry not long trial, failed to conduct lithium iron phosphate clear assessment that can not be concluded that large-scale applications in the communications industry. LifePo4 Battery has a compact, light weight obvious advantages, high temperature capability is more prominent, excellent charge-discharge cycle performance, fast charging, more environmentally friendly advantages, better able to meet the current high temperature part of the base station environment, bearing not meet the requirements of special scenes. Therefore, it is necessary to investigate in depth analysis of prospects for its use in the communications industry.